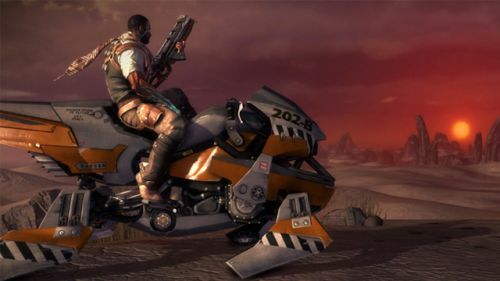 Starhawk, the "build and battle" third-person shooter, is about to become much more accessible. The space western will be available for digital download on the PSN tomorrow. There will even be three ways to buy the game: The full title can be purchased for $39.99, the multiplayer portion of the game is priced at $19.99, and PlayStation Plus Members will be able to download the single player campaign for free. If you have PlayStation Plus, and you haven't played the game, do yourself a favor and download that sucker. The campaign is basically a five to seven hour tutorial of the multiplayer component, but for the low, low, price of el zilcho, it's definitely worth checking out. Starhawk's cooperative survival mode, "Prospector," was a decent continuation of the core gameplay. Unfortunately, it had several flaws. One of the most glaring was the lack of a matchmaking system. There was no way to create or even join a public game. This would leave a player fighting solo if none of their friends were playing the game. It was also hella hard. A new patch that remedies these (and a few other issues) should go live tomorrow. It will include several fixes to both multiplayer and co-op play. Co-Op Prospector is now supported in Quick-Match for matchmaking into public Co-Op games. New Co-Op Prospector options for creating Private or Public games, difficulty, and game name. Public Co-Op Prospector games now are supported in the server-list. Refined difficulty tuning on all Co-Op Prospector Missions (slightly easier). Increased XP payouts for all Co-Op Prospector Missions. Hey, that's awesome! In our Starhawk Co-Op Review I said I'd reevaluate the score if Light Box implemented co-op lobbies. I'll jump on and test them out later this week. Promise! New Gameplay Modes: Assault, Deathmatch Arena, Gatekeeper. 5 New “Small” Maps: Cypress Glade, Space Relay, Scourge Junction, Space Flotilla, Scourge Breaker. Updated pre-placed pick-ups on all maps (just like we did in Cypress) as well as updated Rift Barrel placement. 3 New Build & Battle Load-outs: Trooper, Lightweight and Speeder. New Tool-Tips are displayed on various options and buttons in the Uplink. including a display of all the units in each Load-Out and recommended player counts when you create a new game. MAW Rocket Launcher now can lock-on to the Sidewinder Jet Bike. Added four New national clan banners for our players in the Middle East: Kuwait, Saudi Arabia, Israel and the UAE. Quit Penalty for players that quit during a game — you get a loss posted and SkillScore hit. New “Up Next” display at the intermission screen of what map, mode and load-out is coming up in the next round. More score-limit and time-limit options when creating a game. All three new game modes are added to QuickMatch for matchmaking. Bug fix that ensures that only Clan Leaders/Officers can edit the clan tag field. Added a PlayStation Store button to the Uplink for accessing Starhawk DLC. Increased starting Rift-Energy in Homeworlds. Slightly increased the Galloway Pistol’s head-shot damage. Added a “Grinder” Skill that allows you to start with a Grinder in your weapon inventory. Grinder wind-up time has been reduced. Max range for the Grinder has been increased. In the server-list, the easy “Cake” and medium “Fist” game icons have been removed. You will still see the hard “Skull” game icons. XP payouts for capturing Tier-2 and Tier-3 bases in the Zones gameplay mode. Integrated Starhawk-specific network scan to help players resolve port issues. Added in-game scoreboard HUD for Dogfight & Arena Deathmatch gameplay modes. Starhawk is a PlayStation 3 exclusive. It supports two player local co-op, four player online co-op, and combo co-op.